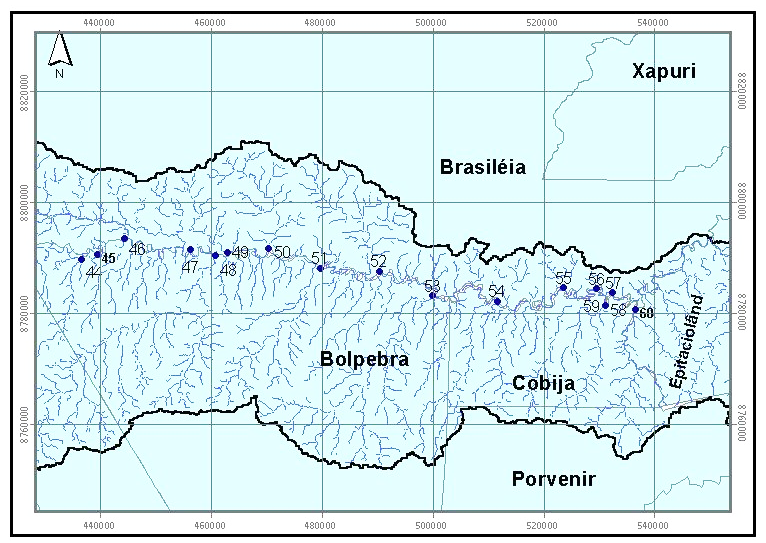 This data set provides coordinates for points at the mouth of tributaries of the Acre River in the Tri-national River Basin in South America. Three Global Positioning System (GPS) readings were made at the outlet of each tributary and the average of the three readings is reported. The Tri-national River Basin is located in the tri-national frontier region of Madre de Dios, Peru, Acre, Brazil, and Pando, Bolivia (known as the MAP region). The MAP region is approximately 300,000 km2. 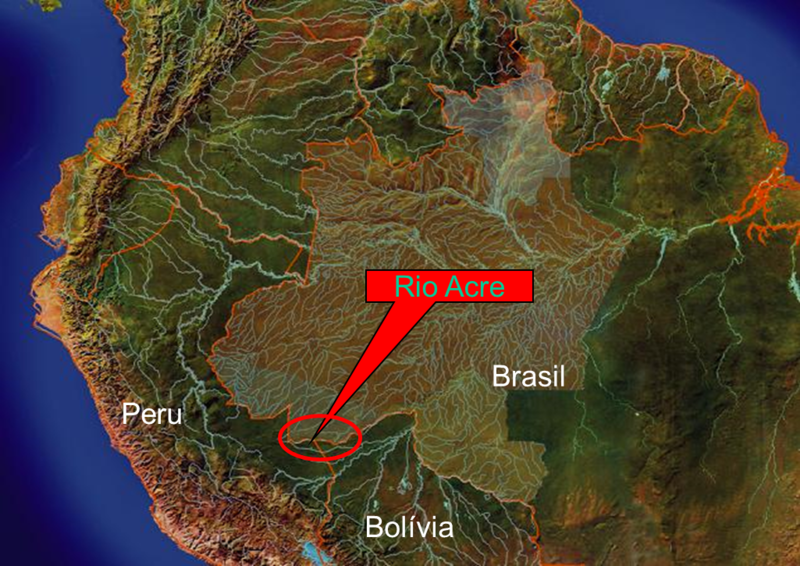 The Acre River flows through Brazil, Bolivia, and Peru. Data on the basin drainage network from the Digital Elevation Model (DEM) Shuttle Radar Topography Mission (SRTM) was obtained as a source of information for the border areas. The GPS readings were part of an assessment of the reliability of the DEM/SRTM drainage network data (Maldonadoae and Brown, 2003). There is one data file in comma-delimited (.csv) format and one compamion file (.pdf) with this data set. DATA QUALITY STATEMENT: This data set provides GPS coordinates only and is not associated with any additional measurements. There is no associated research documentation. Figure 1. The location of the Tri-national River Basin (Maldonado and Brown, 2003). The investigators were Maldonado, Monica Julissa de Los Rios; Brown, Irving Foster; Melo, Antonio Willian Flores de; and Serrano, Rodrigo Otavio Perea. You may contact Maldonado, Monica Julissa de Los Rios (monica_julissa@yahoo.com.br). LC02_Tributaries_Acre.csv. This file provides the average of three GPS readings as X and Y coordinates for 60 areas along the Acre River. Country names are included. The X and Y Coordinates are in the WGS_1984_UTM_Zone_19S system. Note: The UTM zone information was not provided with the data set, however, the UTM Zone 19S covers the MAP region (Perz et al., 2013). The datum (WGS 1984) was provided. Figure 1. Maps depicting the points where the GPS readings were taken. From west to east, the top map provides the points for areas 1-43 and the lower map provides the points for areas 44-60. The X and Y coordinates for the GPS readings are provided in the data file with this data set. Companion file: LBA_poster_Maldonado_Brown.pdf: This is a poster presentation of a reliability assessment of hydrographic data for the tri-national basin. The GPS readings were part of the assessment. The information is in Portuguese. NOTE: The data center has provided the coordinates below. The tributary GPS points are located within the MAP area provided, but the coordinates do not belong to any of the 60 GPS points. These data were used to analyze the reliability of the hydrographic data of Digital Elevation Model (DEM/SRTM), 2000 (Maldonadoae and Brown, 2003). 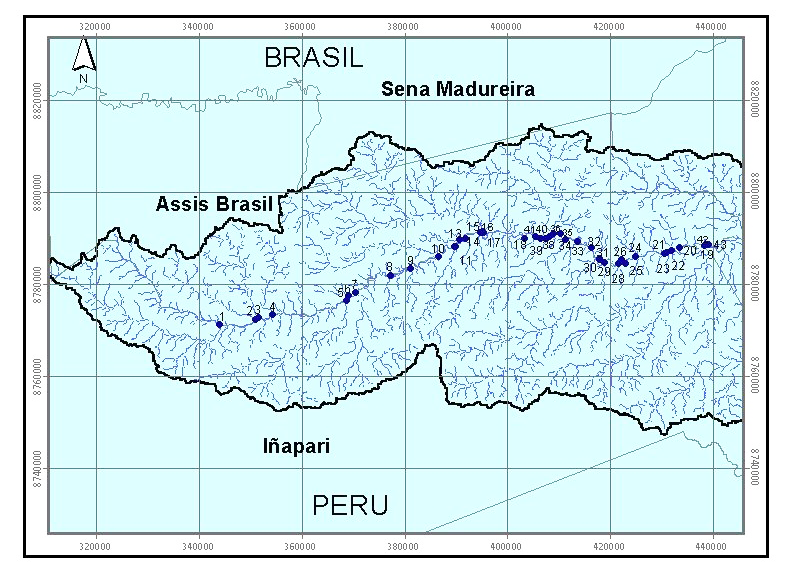 The Tri-national River Basin is located in the tri-national frontier region of Madre de Dios, Peru, Acre, Brazil, and Pando, Bolivia (known as the MAP region) and is one of the few tri-national basins in Brazil. The eastern part of the tri-national basin has the Santa Quiteria extractive settlement, the central part has small ranches. The southeastern area is an Indian reserve in Bolivia and the southwestern area has logging in Peru. The basin is a water source for over 250 thousand people that live in the basin (Maldonado, 2007). The Acre River flows through Brazil, Bolivia, and Peru and is about 400 miles long. Three GPS readings were made at the outlet of each tributary of the Acre River, and the average coordinate is reported in this data set. The GPS readings were part of an assessment of the reliability of the DEM/SRTM drainage network data (Maldonadoae and Brown, 2003). The projection used for the coordinates was UTM WGS 84, UTM 19S. MAP Initiative, Infrastructure and Energy: CHALLENGES FOR GREEN GOVERNANCE IN SOUTHWESTERN AMAZONIA. 2007. Monica Julissa De Los Rios Maldonado1 Luce Program for Green Governance Institute of International Studies, UC Berkeley, USA. Maldonado, M.J. and I.F. Brown. Avaliação da confiabilidade de dados hidrográficos para a bacia trinacional da Bolívia, Brasil e Peru do Alto Rio Acre, Amazônia Sul-Ocidental. Poster. The III Brazilian Congress of Ecology in 2003. Perz, S., Y. Qui, Y. Xia, J. Southworth, J. Sun, M. Marsik, K. Rocha, V. Passos, D. Rojas, G. Alarcon, and G. Barnes. Trans-boundary infrastructure and land cover change: Highway paving and community-level deforestation in a tri-national frontier in the Amazon, Land Use Policy 34 (2013) 27-41.